Upcoming digital soap opera Asunder released its very first promotional cast photo on Monday. The promo features the stars of Asunder, including actor Robert McKay (from the Oscar nominated film Hidden Figures). who stars as the Chandler family patriarch Thomas. Guiding Light alum Kim Brockington (who played psychiatrist Felicia Boudreau on the show from 2002-2008) will play sassy matriarch Adele Chandler, Thomas Chandler's wife. Rounding out the co-stars are Indie Series Award nominated actress Lauren B. Martin (who took on the role of the very loving yet vulnerable Camille Bennett on the popular daytime soap opera As The World Turns from 1997-2000), who stars as the seductive antagonist Serena Hanes. Indie Series Award nominated actor Tony D. Head (who had a recurring role on HBO's hit television series The Wire as Major Bobby Reade) is the patriarch of the Blair family, Austin Blair. Asunder's series regulars also include Dorell Anthony (Pride, All My Children), Terrence Shingler (Gotham), Landra V. Phillips (For My Man), Audrey Looye (Another World, All My Children), Phillip Gregory Burke (Celebrity Ghost Stories), Sekena Chang (Infatuation), Thomas Pierce (I Witness), Ita Korenzecher (Count It Out), and Bernard L. White (Blinded by Love). 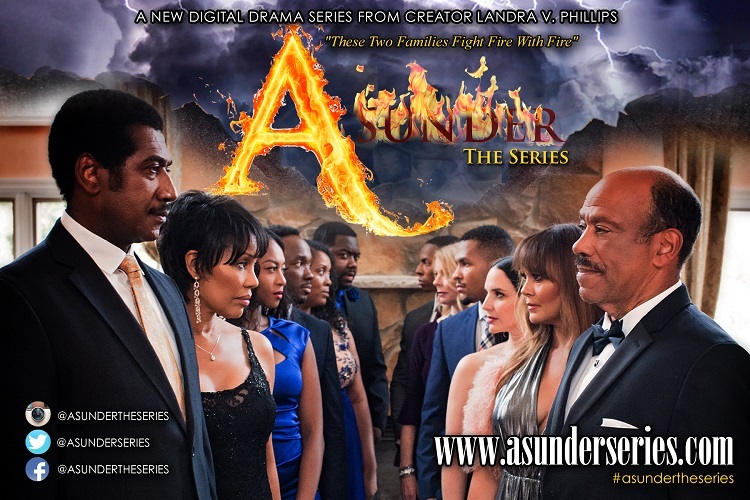 Asunder The Series is the creation of up and coming actress, writer, director, producer Landra V. Phillips. Phillips is CEO of Six Feet High Productions LLC, a boutique film and theater production company based in New York City. A drama and theater teacher for 12 years with the New York City Department of Education, Ms. Phillips has always had a passion for soap operas. Phillips says, "I'm extremely excited about the release of our official Season One promo. I truly feel that it epitomizes the ongoing rivalry between the Chandlers and the Blairs; that soap opera fans and a new generation of viewers will eventually be exposed to." Asunder follows the affluent yet dysfunctional Chandler family who owns Chandler Parfums and Cosmetics Corporation in New York City. The Chandlers are always trying to stay one step ahead of their arch enemies the Blair family, who own Blair Natural Fragrances Ltd. Additional cast photographs from the Season One promotional shoot will be released as the series continues production in New York. For more information about the show please visit www.asunderseries.com.